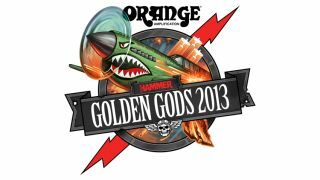 Motörhead are to headline the eleventh annual Orange Amplification Metal Hammer Golden God Awards 2013. Lemmy and co are set to bring the noise to the IndigO2 on 17 June, as Metal Hammer celebrates the finest metal from the last 12 months. Anyone familiar with the Indig02 will know that this it's not exactly the largest venue in the world, and with tickets to the event up for grabs, the Awards represent a rare opportunity to see Motörhead up close and personal. "Motörhead are nothing less than gods among us," says Alexander Milas, editor of Metal Hammer. "Their sound and image are as iconic as they are inimitable, and we're genuinely honoured to have them at the Golden Gods this year. It's gonna be loud!" The awards are reader-voted, and you can make your voice heard over at the official Golden Gods website - by voting, you're putting your name in the hat to win tickets to the Awards in June. Categories include best new band, breakthrough act, best UK band and the Dimebag Darrell Shredder award. For more information, visit the official Metal Hammer website.